Like most New Pokemon Games - whether apart of the same Generation or the start of a new one - Pokemon: Let's Go, Pikachu will introduce a number of Brand New Pokemon Attacks. This was confirmed with the reveal of Pikachu knowing three brand new (and exclusive) moves! The first New attack Pikachu will be able to learn in Pokemon: Let's Go, Pikachu is called Pika Papow. It is a Normal Type Attack, but one that will do increased damage depending on the Friendship Level it has with its trainer. Believe it or not, Pika Papow is the move Pikachu will always use when its Partner Power is activated in battle. 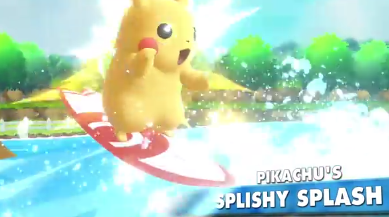 Pikachu's other two New Attacks will be called Splishy Splash (a Water Type Attack that can cause paralysis) and Floaty Fall (a Flying Type Attack that causes damage to foes).